First win of MLB season: Dodgers 3, D-backs 1. 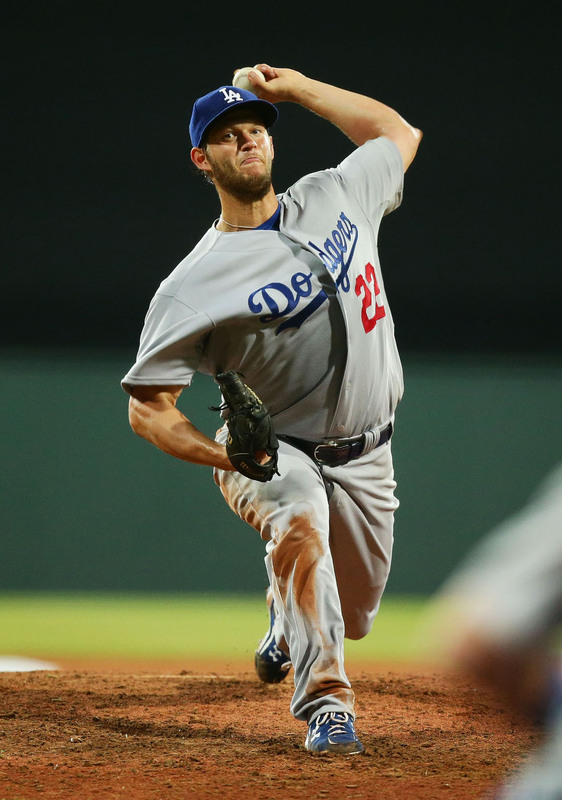 First winning pitcher: Clayton Kershaw (1-0), making it four consecutive Dodger wins when he starts on Opening Day. And first photograph (above, great shot by Matt King for MLB Photos via Getty Images) of a winning pitcher delivering a pitch with a huge dirt stain on his knee thanks to sliding into second base trying to stretch a single just moments before, ultimate gamer moment. Click here for the first Photo Gallery. First losing pitcher: Wade Miley (0-1) — but a strong outing. First announced crowd: 38,266 at Sydney Cricket Ground. 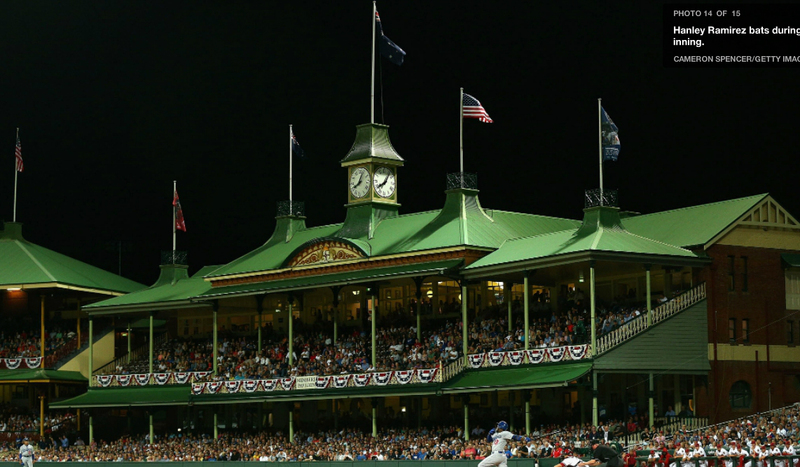 Cheers to the 38,266 fans that joined us Down Under tonight at @scg! First usage of “4:33 in the morning back in Los Angeles” by Dodgers play-by-play man Charlie Steiner, during top of the ninth, on KLAC via MLB.com Gameday Audio. First ultra-aggressive hitter of 2014: Goldschmidt. He has seen five pitches in four ABs. And is hitting everything on the screws, probably boding well for some fantasy managers. First call to Dodgers bullpen: Chris Perez — who earned his first save against the Dodgers in 2008 for St. Louis — replaces Kershaw after 6 2/3. Kershaw left his mark. First usage of “Well, it’s 4 o’clock in the morning back in Arizona”: By D-backs’ KTAR radio play-by-play man Greg Schulte to start the bottom of the seventh. First seventh-inning stretch: 7 a.m. ET on March 22, 2014. Many fans in the U.S. are doing a morning stretch. First gasp by Dodger fans: Kershaw hustling all-out to second in the top of the seventh and sliding on a single in which he is easily thrown out trying to stretch into a double. It denies him a second straight Opening Day extra-base hit, following his homer that won his start last year. First run of the season off Kershaw: Mark Trumbo 4-3 groundout in the sixth (Justin Turner’s fifth assist so far) scores Goldschmidt from third, cutting the Dodger lead to 3-1. It follows consecutive Kershaw wins on Opening Day in which he threw nothing but goose eggs. First Arizona extra-base hit: Paul Goldschmidt leadoff double against Kershaw in the bottom of the sixth. First Web Gem of 2014: D-backs third baseman Martin Prado springs up like a cat to rob Ethier of a hit, ending the top of the sixth. First call to the bullpen: Will Harris in to start top of the sixth for Arizona and cools off Van Slyke with a fly to right. Miley pitched five innings, allowing three earned runs on three hits, striking out eight and walking one. He threw 83 pitches, 54 for strikes. First wave by a crowd: Sydney Cricket Ground in fifth inning. Chappell says on MLB Network that when they do the wave in cricket games, it usually is stopped once it gets to the Members Pavilion. “I don’t know if they think it’s beneath them,” says the Australian Cricket Hall of Famer. First great at-bat by a pitcher: Miley nine-pitch at-bat against Kershaw ending in a 4-3 and unexpectedly working the Dodgers ace. First run and RBI: Andre Ethier 4-3 groundout scoring Adrian Gonzalez in the second. First Wrigley Field comparison for Sydney Cricket Ground: “Think Wrigley Field, it’s blowing down,” by MLB Network analyst and cricket Hall of Famer Ian Chappell, on Scott Van Slyke wind-blown homer-turned-double. Also first utter confusion, with Van Slyke congratulating first base coach on home run trot and Mark Trumbo climbing way over fence in left. First base on balls: Adrian Gonzalez on four pitches. First Clayton Kershaw strikeout victim: A.J. Pollack on three pitches. First groundout: Hanley Ramirez, 4-3 to end a 1-2-3 top of the first. Follow MLB.com Gameday for pitch-by-pitch. First strikeout: Puig on three pitches, strike three in the dirt and thrown out at first. First pitch: 5 a.m. ET , Wade Miley strike low and inside to Yasiel Puig. First on-field uniformed personnel introduction: Dodgers assistant hitting coach John Valentin. First rain delay: Sydney Cricket Ground. Tarp removed 4:30 a.m. ET. Introducing our new Grand Openings blog at MLB.com. I set my alarm for 3:50 am ET, started reskinning the Opening Day Countdown Down Under blog, and over the next hours recorded firsts in a celebration of the return of real Major League Baseball action. Follow this blog! Finally! Season 2014, and here we go!